The PLCLogix I/O chassis shown in Figure 1-3 contains discrete input and output modules as well as BCD and Analog input and output devices. 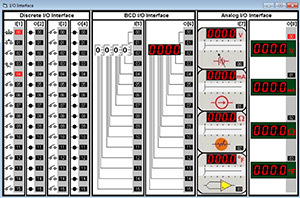 It is used by PLCLogix 5000 and PLCLogix 500, along with the 3D Worlds, to provide I/O. There are two 16-point discrete inputs and two 16-point discrete outputs. There are five different input switches: NO switch, NC pushbutton, NO pushbutton, NO limit switch, and NC limit switch. The discrete output simulators use green LED lights to indicate when an output is ON or OFF. 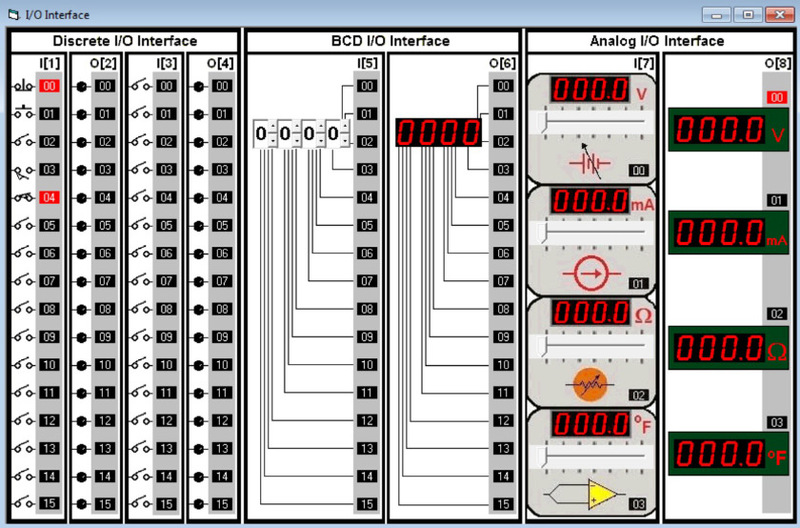 The BCD input and output modules are designed to simulate a range of decimal input and output values. The 4 BCD thumbwheels connected to the BCD input module allows for decimal values of 0000 to 9999 to be entered. The output value is displayed using four 7-segment displays to indicate a decimal range from 0000 to 9999. The Analog I/O interface in the PLCLogix chassis provides a four-channel analog input and a four channel analog output. The analog input signals simulated are voltage, current, resistance, and temperature. Each of the four channels has a default setting of one of these signals. The channels can be further customized (i.e. two temperature sensors) by changing the values in the parameter settings window. The analog input and output displays also include a decimal point and linear adjustment for setting precise analog input values ranging from 000.0 to 999.9.